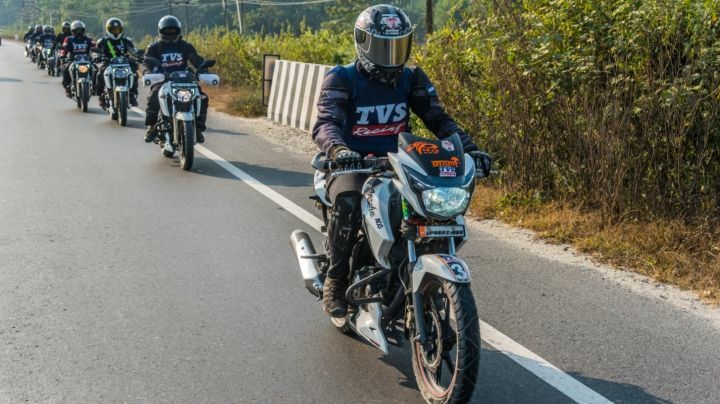 TVS, the Hosur based manufacturer, has kicked off its first international ride to Bhutan for Apache Owners Group (AOG) in India. 17 lucky Apache owners, comprising of both men and women riders will begin their journey from the foothills of Siliguri, West Bengal and travel across the beautiful landscapes of Bhutan. The entire ride will span across 10 days and cover a distance of 2000km. Participants will embark on this journey astride various TVS Apache motorcycles, namely – the TVS Apache RTR 160, Apache RTR 160 4V, Apache RTR 180, Apache RTR 200 4V and the Apache RR 310. This is an exclusive chance for all AOG members to participate in an international ride. The itinerary in Bhutan comprises of a ride from Phuentsholing towards Thimpu. This will be followed by a visit to the world’s largest Buddha statue in Kuensel Phodrang. The expedition then moves towards Punakha valley before entering the Jigme Singye Wangchuck National Park, succeeded by a visit to the Taktsang Monastery, otherwise known as the Tiger’s Nest, in Paro. The last leg of the journey will see AOG members riding to the highest motorable pass in Bhutan, Chelel La, before heading back to Siliguri. Siliguri, December 04, 2018: TVS Apache, the premium motorcycle brand from TVS Motor Company, today flagged off its first international ride of Apache Owners Group (AOG) to Bhutan. 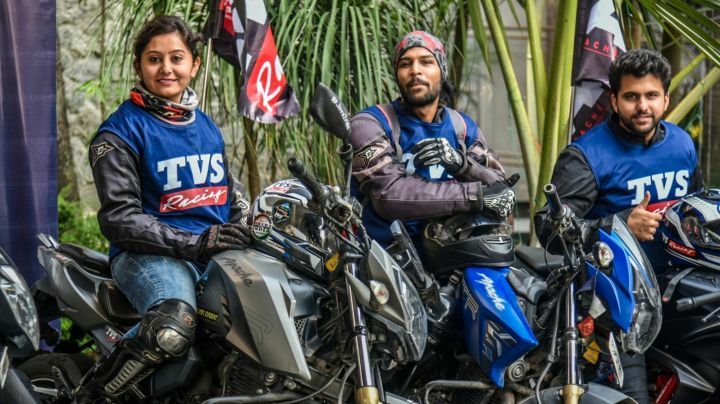 The ride, which commenced from Siliguri, West Bengal, will see 17 TVS Apache owners, both men and women riders, traverse across the landscape of Bhutan astride their TVS Apache motorcycles. The entire range of TVS Apache motorcycles namely – TVS Apache RTR 160, TVS Apache RTR 160 4V, TVS Apache RTR 180, TVS Apache RTR 200 4V and TVS Apache RR 310 will be participating in the ride. The riders will cover a distance of 2000 kilometers over the course of 10 days. With many successful rides conducted across India, TVS Apache is now giving AOG members in India an exclusive chance to participate in international rides. Post departure from Siliguri, the team will reach the small bordering town of Phuntsholing. From there on, they will proceed to the vibrant capital of Bhutan – Thimpu, followed by Kuenselphodrang where they will get an opportunity to see the world’s largest statue of Buddha. On the 5th day, the adventure continues on to Punakha valley along the banks of two prominent rivers in Bhutan – Mo Chu and Pho Chu. The ride will also see them traverse through the Jigme Singye Wangchuck National Park (home to Himalayan black bears, red foxes and black necked cranes, etc.) before moving to picturesque Paro and embarking on a journey to get a glimpse of the famed Tiger’s Nest or Taktsang Monastery. To end on a high, the riders will scale the highest motorable pass in Bhutan, Chelel La, on their TVS Apaches before concluding the ride at Siliguri. TVS Apache Owners Group is a community of passionate and like-minded TVS Apache riders sharing a common platform to explore and spread their enthusiasm for motorcycling. Today, AOG has an active rider base in more than 35 cities. AOG rides are an ideal opportunity for riders who unite frequently to explore fantastic trails and remote locations on their TVS Apaches.